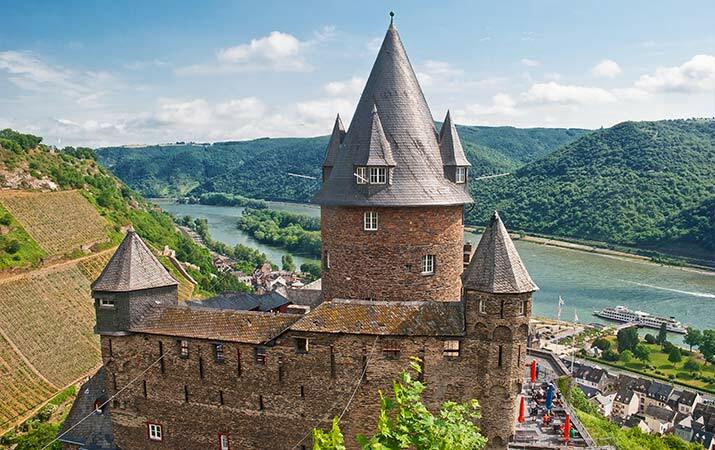 On our last trip to Europe, we wanted a Rhine Valley day trip, including a boat cruise, time to explore two towns and a legendary medieval castle. 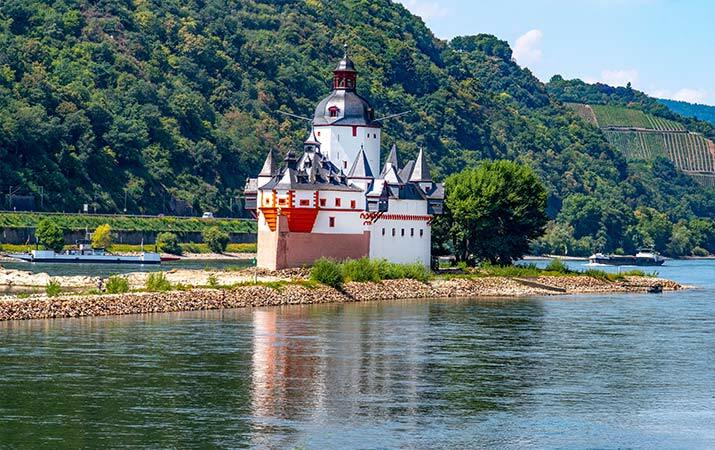 The Rhine River is one of the great rivers in the world, and the section from Mainz to Koblenz in Germany is one of the most scenic. For our day trip, from the Frankfurt Airport, we rode the train to Bacharach, wandered the old city and hiked up to Stahleck Castle. Next hopped on a boat cruise downstream to St. Goar. 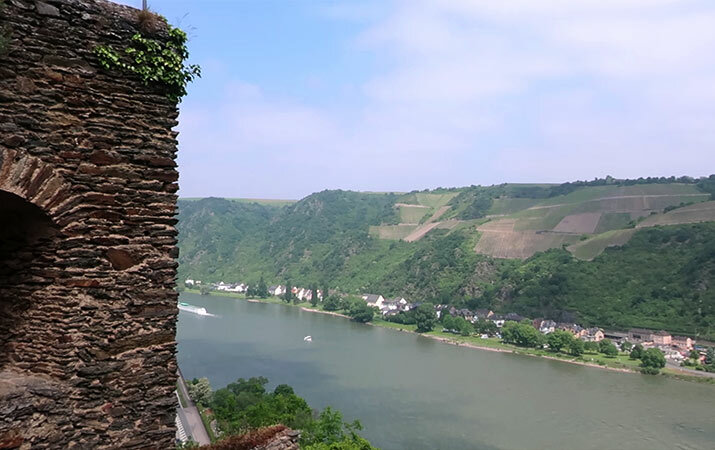 In St. Goar, we explored Rheinfels Castle, then took the ferry across the river to St. Goarshausen, returning to Frankfurt on the train, with excellent views from the right side of the river. Bacharach is charming 900 year old town with half timbered houses painted red or brown, decorated with green shutters, medieval watchtowers of the old city walls are beautifully preserved. 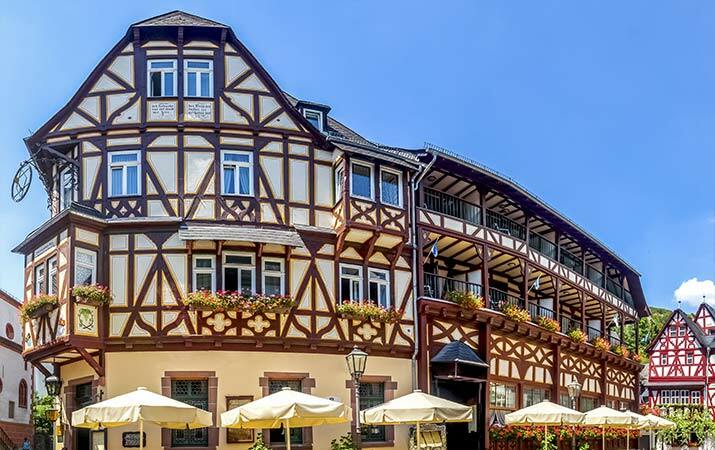 Wander through streets of the old city (Altstadt) or take a longer hike up the hillside on the Bacharach Town Wall Walk (Stadtmauer Rundweg). Start at St. Peter’s church (Peterskirche), and follow the signs for Burg Stahleck (Stahleck Castle) and Werner Kapelle (Werner Chapel). The path goes up stairs to the left side of the church. Werner Chapel is a medieval pilgrimage church, destroyed in 1689 by the French, but the ruins are beautifully restored. 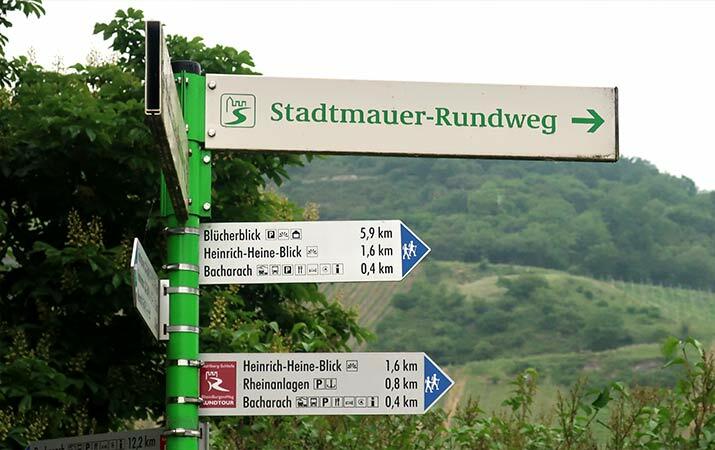 Continue walking up the path through a lush forest, with views of the Rhine River below. When you reach Stahleck Castle, stop into the cafe in the castle courtyard for cold drinks, coffee, pastries and snacks. 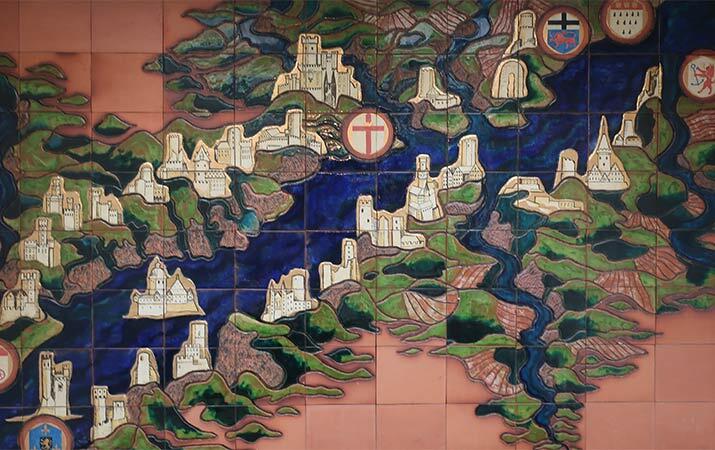 Continue following the trail, Bacharach Town Wall Walk (Stadtmauer Rundweg), and sign that points south, Bacharach .4 km. 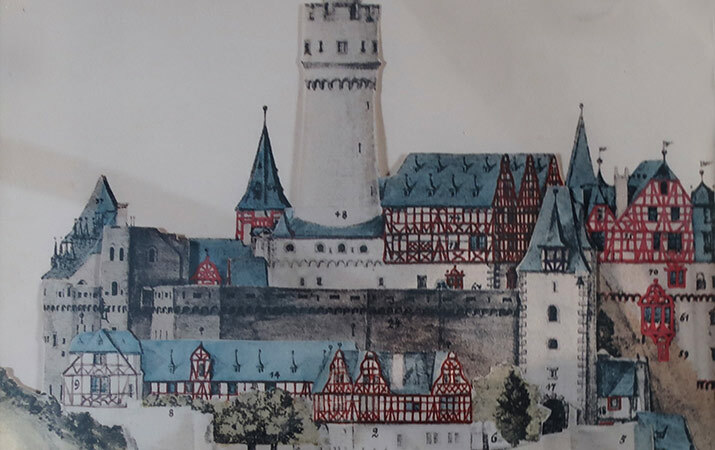 You’ll pass by a beautifully preserved semi-circular stone tower (Halbrundturm), topped with crenellations, once part of the wall fortifications that protected the town. The trail down goes down the hill, passing by three more stone towers, fields with wildflowers, and benches, perfect if you brought a picnic lunch. The trail ends at Mainzer Strasse, the main street through the old city. 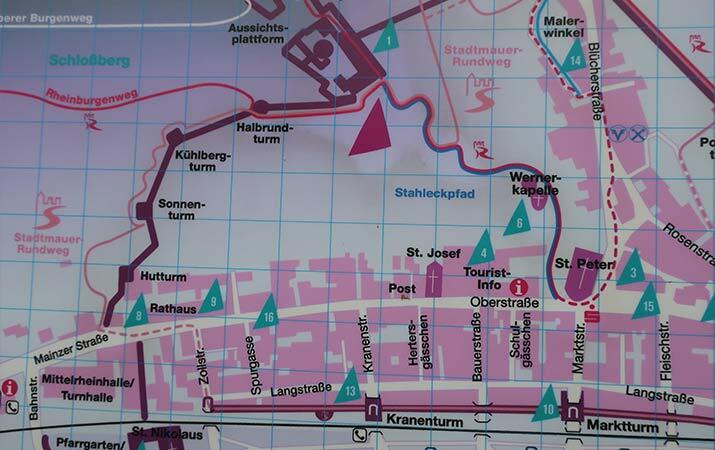 Follow Mainzer Strasse to St. Peter’s church, where you started. From there, it’s just a short walk down Markt Strasse, under the 14th century Marktturm watchtower, to the Rhine River and KD boat dock. Along the Rhine River is a grassy promenade, kids can run around, and there’s a small playground. Tip: You can buy tickets for the boat at the dock, but in summer months to be sure tickets are available, buy your tickets online in advance. Highlights of the boat cruise from Bacharach to St. Goar are Pfalzgrafenstein Castle and Loreley Rock. Pfalzgrafenstein Castle (photo above) is a castle in the middle of the river, and it looks like a boat, its prow pointing upstream. The island castle was built to collect tolls from passing ships. Loreley (Lorelei) Rock is the most narrow part of the Rhine, a rocky section with whirlpools in the river. 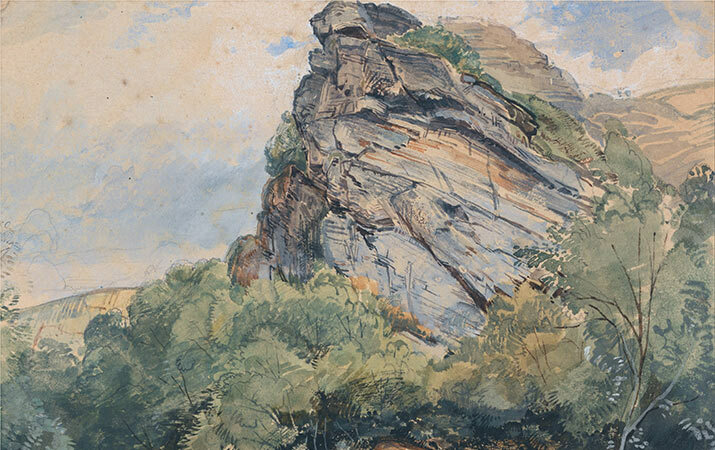 In legend, the rock was home to a beautiful woman with powers of enchantment; she sang songs to lure sailors to their death in treacherous waters. Rhinfels Castle is a legendary fortress-castle overlooking the Rhine River and town of St. Goar (Sankt Goar). The castle, built in 1245 by the local count, expanded in a well defended fortress, residence and administrative center. 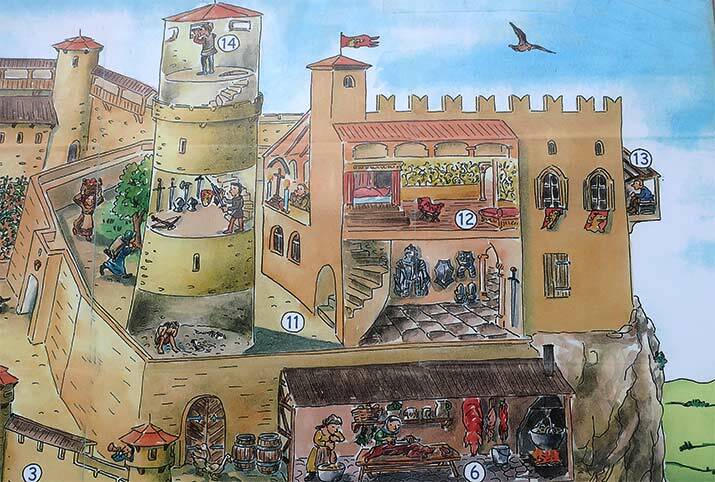 From the Middle Ages through the Renaissance, the castle was attacked again and again, but not conquered. In the late 18th century, the French army took possession of the castle, and later blew up the massive stone fortifications. 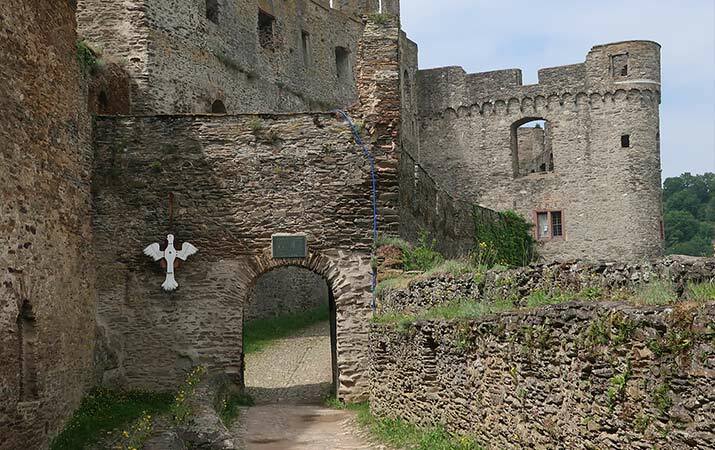 Today Rheinfels Castle is a mighty ruin and a must-see exploring castles with kids. To get to Rheinfels Castle from the town, take a taxi (across from City Hall), or with bigger kids, it’s fun to walk up the hill. From the City Hall (Rathaus), turn up Schlossberg street, then turn right on Bismarckweg. When the road ends, take the path up the hill to the castle. After the castle entrance, follow the route starting at the Clock Tower, then walk along the battlements. Look down over the Rhine River, imagine customs collectors taking tolls from all the boats passing both up and downstream. 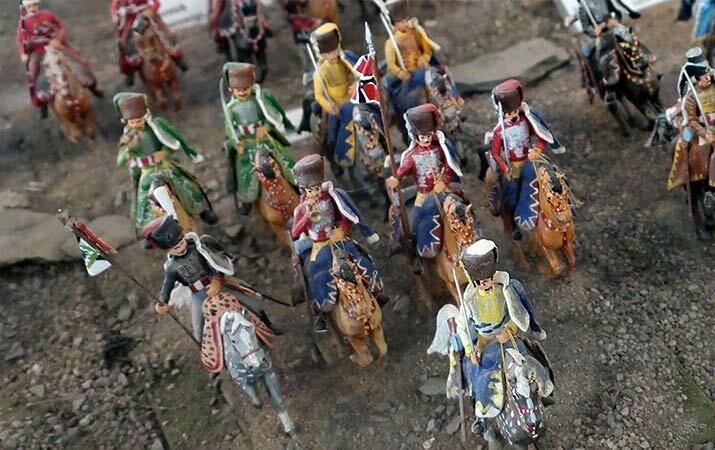 After the third gate, be sure to stop in the local history museum, (Heimatmuseum) to see exhibits about the castle history, including coats of arms, armor, cannonballs, tin soldiers, and excellent model of the fortress. In the Inner Courtyard, originally this area included the kitchen, arsenal, and tall castle keep, more than 120 ft. high. Step into the Stair Tower, and look up to the sky above. Go through the gate of the massive shield wall, bordered with a round watchtower, passing by the stables, and the 15th century well (water was very important when the castle was besieged for long periods of time). Walk past the high battery, and walk up the stairs to the ramparts – look over the moat to the east – and walk to the top of the Clock Tower. Panoramic 360 degree views of the Rhine River and surrounding countryside. Tip: This route through the castle is what you see in the video, but allow plenty of time for kids to explore all the nooks and crannies of the fortress. 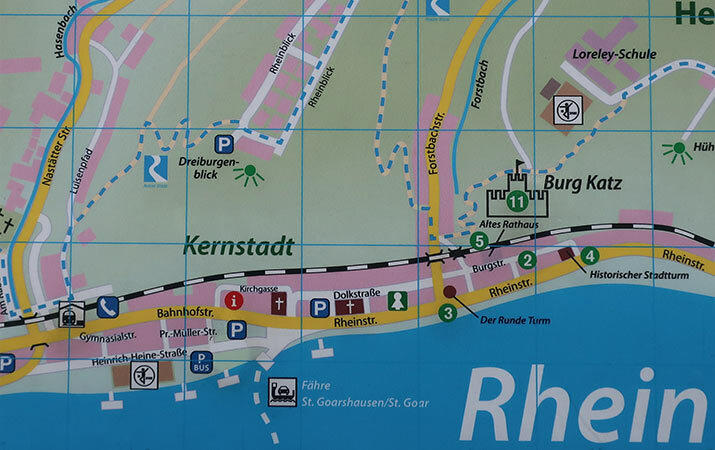 Take the car and pedestrian ferry (fahre) from St. Goar, across the river to St. Goarshausen (ferry runs daily). While you’re waiting, kids will have fun watching all the boats go by – passenger cruises, barges carrying cargo, container ships, yachts, motor boats, police boats, fire boats. Leaving the ferry on the St. Goarshausen side, it’s just three blocks to walk to the train station, for a train ride back to Frankfurt.